I am entering this card I made for my sweet hubby into the CAS Watercolor Challenge. I saw the very talented Heather Telford use this technique and tried it out, but it did not turn out as I expected. 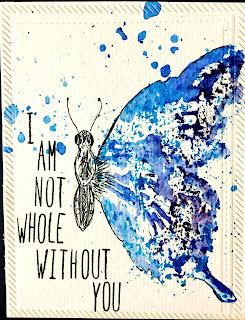 I used the old favorite, Stampin' Up Swallowtail and stamped it in water -sprayed the heck out of it but missed half of the butterfly. I dropped some blue and violet Brusho and moved it about with a brush only then noticing that I only had half a butterfly, but I thought it was so pretty I decided to use it. I confirmed the body with some copic multiliner black pen and used the Lawn Fawn Milo alphabet, finishing up with the slanted rectangle die from My Favorite Things. Great job with this technique Mary!! Your buttterfly card is amazing. Love the artsy look with showing only half the butterfly. So perfect with the sentiment. Thanks for sharing with us at CAS Watercolour! I love that this is half the butterfly, Mary! What a beautiful butterfly it is too! Thanks so much for sharing this with us at CAS Watercolour! 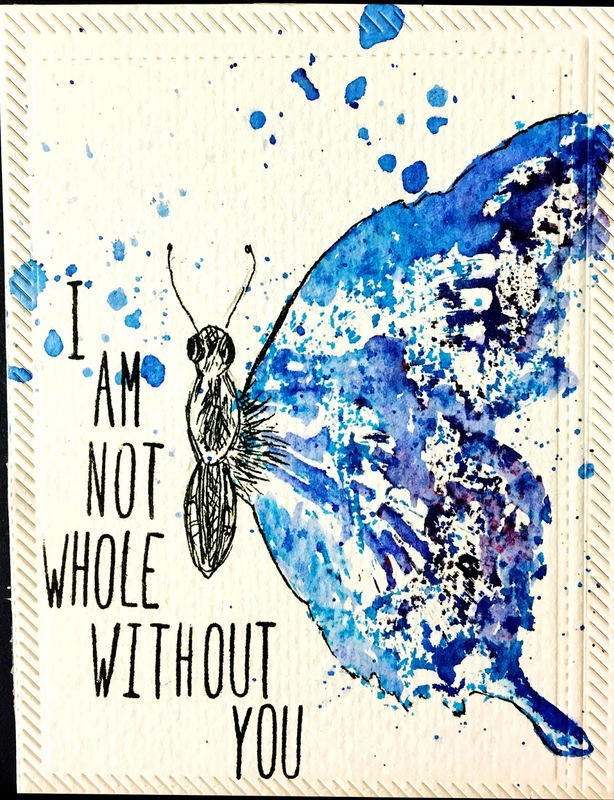 I think your sentiment makes it look like you meant to only color 1/2 your butterfly. TFS Mary and joining us at CAS Mix UP. Hugs. You know, I have never done this blogging before, but your kind words make me feel like doing more- Thank you! Didn't even notice you meant to have half a butterfly, I think it gives a better effect like this. Your beautiful card just jumped out at me from all the other cards!